Time of Origin: Unspecified date in the future, but has been found on the planets Deva Loka, Manussa and Trenzalore. Appearances: "Kinda", "Snakedance", "The Cradle of the Snake" and "Tales of Trenzalore: The Dreaming". History: One of The Doctor's most powerful and mysterious enemies, the Mara was a manifestation of pure evil, described as having originated from 'the dark places of the inside', apparently one of many such creatures. The first Mara that The Doctor encountered existed on the planet Deva Loka, where it had apparently destroyed the civilisation of the seemingly primitive Kinda many times, enjoying their suffering, although The Doctor later learned that the Mara was apparently created on the planet Manussa. Centuries in the past, Manussan scientists created a Great Crystal to focus the energies of the human mind, but it absorbed only the negative energies, the Mara being created when these energies were reflected and amplified by the crystal, although it was eventually contained once again. As a being of psychic energy, the Mara was only able to gain physical form by gaining access to an unshared dream, with the result that it was contained for centuries as the native Kinda possessed a subtle telepathic link to each other that they primarily used to communicate ("Kinda").When the TARDIS visited the Kinda homeworld, the Fifth Doctor's companion Tegan Jovanka fell asleep underneath a series of wind chimes, her 'unshared' mind lacking the defences against telepathy that the Kinda had developed, Tegan being left on her own as Nyssa recuperated from a recent illness in the TARDIS while the Fifth Doctor and Adric were captured by an Earth expedition to Deva Loka; strange disappearances had reduced the expedition's numbers by half and the second-in-command was close to breaking point. After the Mara inflicted various assaults on Tegan's sanity, such as a pair of illusions that dismissed her as the dream and a doppelganger of herself, Tegan was finally convinced to become the Mara's host, allowing it to move from Tegan into a Kinda host. With the expedition members having almost all suffered a mental breakdown - the commander returned from the jungle an infantile and compliant man while his second became increasingly dangerous, to the point that he believed the plants were a danger, The Doctor was forced to escape with the expedition scientist, Todd, when the commander gave them a box containing a telepathic message from the Kinda mystic, Panna, and her young ward Karuna, the only Kinda capable of vocal speech. As the Mara's new Kinda host, Aris, took control of the Kinda tribe, Panna revealed the threat the Mara posed to The Doctor and Todd in a final vision, allowing The Doctor to find Tegan, who retained some memories of the Mara's time in control even after it had left her, although these felt more like a dream to her than a real event. While Todd used the telepathic box to restore the expedition members' sanity, The Doctor was able to defeat the Mara by erecting a series of mirrors around its current host - based on the old superstition of evil being unable to face itself -, forcing the Mara to face its own reflection and driving it out of Aris until it collapsed down into itself, returning to the Dark Places of the Inside. The Doctor confronted the Mara again when Tegan, still slightly under the Mara's influence, redirected the TARDIS coordinates to land on the planet Manussa, the former location of the Sumaran civilisation that had been ruled by the Mara for around six hundred years after it first manifested from the Great Crystal before it was destroyed by the founders of the Federation of Worlds that now ruled the planet. 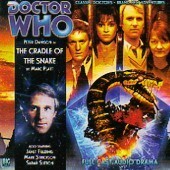 When they discovered a snake-shaped cave mouth, Tegan fled in fear and fell under the control of the Mara once again, The Doctor's attempts to convince the Federation representatives of the Mara's return meeting with failure as they prepared for a celebration to commemorate the Mara's defeat. Learning of the existence of the Snakedancers, a quasi-religious group that believed that the Mara would one day return and had spent years preparing in secret to purify their minds to resist the Mara, The Doctor and Nyssa determined that the Little Mind's Eye Crystal and its larger counterpart, the Great Mind's Eye, could serve as focal points for energy that would turn thought into matter, allowing the Mara to regain corporeal form. While Tegan/the Mara took control of Lon, the son of the Federator who ruled the Federation, so that he could rearrange the celebrations to allow the Mara to return, The Doctor and Nyssa escaped with the snakedancers, The Doctor eventually communicating with Dojjen, an ancient mystic of the group. Guided by Dojjen to find the 'still point' within himself, The Doctor was able to confront the Mara even as it began to manifest in the cave, instructing the other people in the cave as the ceremony concluded to avoid looking at it to limit the fear it could feed on. Despite the Mara's attempt to trick The Doctor into looking at it by using Tegan's voice, The Doctor used the Little Mind's Eye Crystal to contain the Mara once again by destroying the Great Crystal, depriving it of the opportunity to spawn again, although Tegan was left particularly affected by her time as the Mara's host and The Doctor himself noted that it was possible that other Mara could manifest in other ways. The Doctor faced the Mara for a third time when he, Tegan, Nyssa, and new companion Turlough learned that the Mara retained influence over Tegan, with The Doctor's attempt to banish it from Tegan only resulting in it transferring itself into The Doctor. Having consulted a book in the TARDIS library to learn about its history, the Mara/Doctor took the TARDIS to Manussa - officially claiming that 'The Doctor' wanted a Manussan doctor to take a look at Tegan -, arriving on the planet a century before the Sumaran Empre was established, and began a scheme to subjugate Manussa in that time period. With The Doctor as its primary host, it possessed several other hosts, using experimental Manussan technology and blue crystals to project the thoughts of its hosts into solid matter, manifesting a physical form of its usual giant snake. Although it took Nyssa and Turlough as additional hosts, Tegan was able to free Turlough from its influence and subsequently free The Doctor using a circle of television cameras and screens to pull the Mara out of him, similar to the reflective panels he had used when facing it on Deva Loka. Returned to normal, The Doctor attempted to reverse the Mara's physical manifestation by linking the crystal it was using as a link to the physical world to the TARDIS, but the Mara was able to swallow the TARDIS when The Doctor tried to bring the crystal into physical contact with the Mara for the plan to work. In the end, the Mara was only defeated when a young man who had been created by the crystal technology allowed the Mara to swallow him while he was holding the crystal, destroying the Mara and restoring the balance. However, The Doctor noted that the Mara's essential essence remained in all living beings, meaning that it could never be completely destroyed. The Doctor faced the Mara again in his eleventh incarnation during the Siege of Trenzalore, when The Doctor discovered that Trenzalore was the location of a crack in reality that would allow the Time Lords to return to this universe, leaving him trapped on Trenzalore as various races wanted the planet destroyed to prevent the return of the Time Lords - and thus potentially start the Time War all over again - but couldn't force The Doctor to leave in case he spoke his name and released them ("The Time of The Doctor"). Although Trenzalore was surrounded by a barrier that prevented technology from entering the planet, the Mara's non-corporeal nature allowed it to penetrate the barrier, possessing various residents of the town called Christmas where The Doctor was staying so that they would dig up the body of Jalen Fellwood, one of the first settlers of Trenzalore who had been executed after he tried to sacrifice his wife to his 'gods' ("Tales of Trenzalore: The Dreaming"). Using the dreams of the residents, the Mara was able to turn Jalen's body into a human/snake hybrid form that it could use to physically manifest on this plane, subsequently taking possession of the town's children and threatening to make them harm the adults and then themselves unless The Doctor released the Time Lords to restart the War, creating more darkness for the Mara to feed on. However, its continued reliance on Jalen Fellwood's body allowed The Doctor to defeat it by filling a snow machine with salt and releasing it on the Mara, Jalen's belief in salt's magical properties forcing the Mara to retreat as it drew power from this belief. Although the Mara has yet to return to the television series, the Ninth Doctor's and the Tenth Doctor's immortal companion Captain Jack Harkness mentioned that a race of fairies that he and his team were dealing with were similar to the Mara ("Small Worlds"), but he may have been referring to the old spirits from Earth mythology rather than this Mara. Regardless, the Mara remains a prominent threat, with the Tenth Doctor mentioning the Mara during his brief meeting with the Fifth ("Time Crash") and Tegan often portrayed as experiencing nightmares of her time as its host even after leaving the TARDIS.